The Week Leading up to… Sunday, November 24, 2013. St. Paul’s Letter to the Galatians (6:11-18). He was instructed in the Faith of Christ by St Peter himself, and may be the Clement mentioned by the Apostle Paul as a fellow-worker in Philippians 4:3. He was consecrated Bishop of Rome about the year 91; some traditions call him the first Bishop of Rome, others the third after Saints Linus and Anacletus. (This is not necessarily inconsistent: in the Apostolic age, the offices of Elder and Bishop were not strictly distinguished, and the three bishops may have served at the same time or by turns.) He is the author of the Epistle of Clement, which was so highly esteemed in the early Church that it is often found in early versions of the New Testament. The holy Bishop effected countless conversions in Rome, even bringing the Prefect Sisinius and his wife Theodora to the Faith after miraculously healing them of blindness. The bishop’s success so angered the Emperor Trajan that he had Clement exiled to the Crimea, on the far eastern frontier of the Empire. There the holy bishop continued to work wonders of evangelism, founding seventy-five churches in one year and bringing countless pagans to faith in Christ. 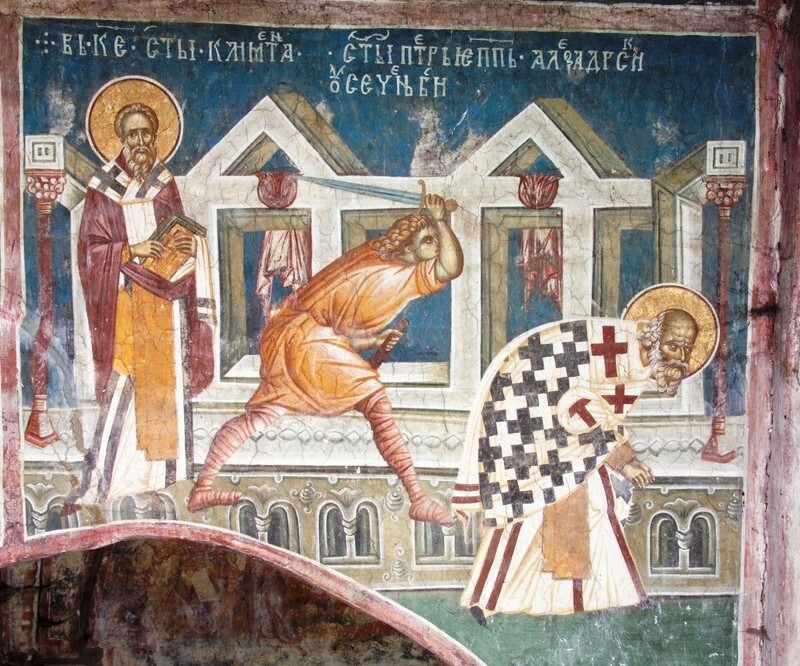 Finally, to put a stop to the Saint’s work, the Governor of the region had him cruelly tortured, then thrown into the Black Sea with an anchor around his neck. More than 700 years later, in 860, St Cyril (commemorated May 11) arrived in the Crimea, sent by Saint Photius, Patriarch of Constantinople. He found the relics of St Clement faithfully preserved there and brought part of them back to Constantinople. Saint Peter was Bishop of Alexandria for twelve years. It was he who excommunicated Arius. When some of Arius’ followers appealed to the Bishop to restore Arius to the communion of the Church, they were surprised by the bishop’s vehement refusal, for the heretic had not yet clearly and publicly made known his blasphemous teaching that the Son is a creation of the Father. The holy bishop then revealed to these followers a vision he had seen, in which Christ appeared to him as a child wearing a garment torn in half from head to foot. When St Peter asked the Lord who had rent His garment, he said that it was Arius, who must not be received back into communion. The holy bishop was beheaded during the reign of Maximinus. He is called the “Seal of the Martyrs” because he was the last Bishop of Alexandria to suffer martyrdom under the pagan Emperors. He was a soldier from Byzantium, one of the defenders of Smolensk when it was besieged by the Tatars in 1238. One day the Mother of God appeared to Mercurius and told him that the Tatars were preparing a surprise attack — and, further, that he must take up arms and attack the enemy single-handedly. Placing all his trust in God, the lone soldier threw himself against the Tatar host crying ‘Most Holy Mother of God, help me!’ He was quickly surrounded and cut down, and it appeared that his action had been as foolhardy as it had seemed, when a woman at the head of a glorious host, all of them surrounded by light, appeared and threw back the Tatar army. The next morning the people of Smolensk found the ground covered with the bodies of their enemies. They buried Mercurius in the Cathedral, where he has been venerated as a Martyr ever since.